Don Smith (California, United States) on 12 January 2011 in Landscape & Rural. Full Moon Over Red Rock, Arches, and Canyons - 3rd Annual Arches/Canyonlands Photo Workshop - October 9-13, 2011 (only 4 spots remaining). *** PLEASE NOTE: I AM CURRENTLY IN BIG SUR TEACHING MY WINTER WORKSHOP. I MAY NOT BE ABLE TO RESPOND TO YOUR COMMENTS BUT I WILL CERTAINLY LOOK FORWARD TO READING THEM! I have been having a lot of fun recently culling through some of my older images and looking at them with a fresh eye. It amazes me how differently I feel about the image after putting it on the shelf for a while. Today's image is a good case in point. I always liked the composition of this image but never felt the processing brought it to its full potential. 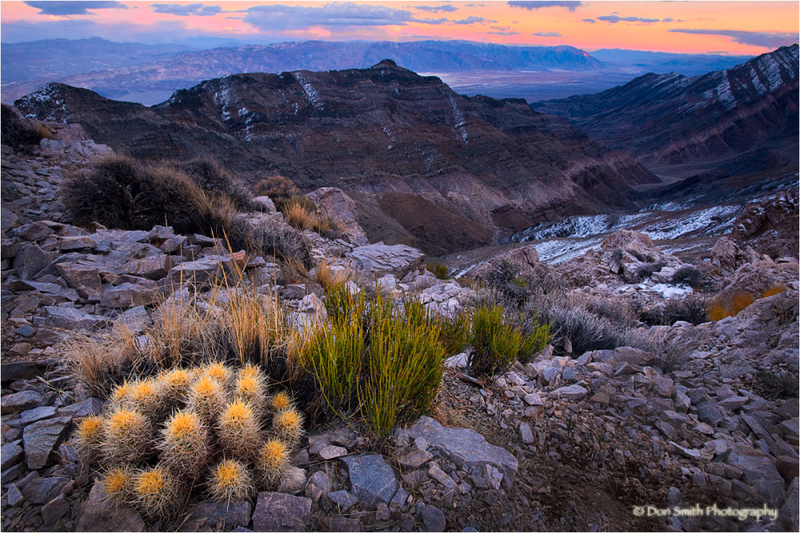 I made this image a few winters ago while co-teaching Gary Hart's Death Valley workshop. We will be back in DV in a couple weeks for another workshop and hopefully can reach some of the higher destination points such as Aguereberry Point at an elevation 6433 feet. On this particular evening, we arrived about an hour prior to sunset and I can still remember the chill in the air. Coming from the Valley below, the temperatures tend to plummet and the spring-like lower-elevation conditions quickly revert to winter at these higher locations. Yet the transition in temperatures are more than worth the amazing views found at these heights. It is easy to be seduced by the grandeur of the scenery, yet I still feel it is important to adhere to the concept of creating depth in a scene. This meant scrambling around the rough granite outcroppings looking for something in the landscape that lent itself to a foreground object. I stumbled across this small barrel cactus and knew I had my foreground. I balanced the warm tones in the sky with the help of my Singh-Ray 3-stop soft edge GND. Using my 16-35 mmL allowed me to create an illusion in the relative size of the cacti and an aperture of f/16 carried the focus throughout the frame. What I did different in processing was actually simple. I used the Brilliance/Warmth filter in Nik's Color Efex Pro to bring out the colors that seemed somewhat subdued in the original version. Two simple sliders accomplished my goal in less than 10 seconds! Seeing old images with a fresh eye is worth the effort. Try it with some of your older images that didn't quite make the cut the first time around. Perhaps that image you always had hoped for but originally fell a bit short is awaiting your discovery. Happy hunting! Very nice, Don! You make an excellent point. I have been picking out my "best of 2010" and went back into the work I did in Death Valley and Lone Pine with you and Gary. I have learned so much in the past 12 months about PS and some Nik plug ins - and I reprocessed some of that work with great results! We did have amazing light at that workshop, particularly at Lone Pine. I hope you have a good group and lots of fun this year. Wish I were with you again! @Barbara Lee: Gary and I have returned from taking the group to the Pfeiffer Arch for sunset and had one of the best light shows in recent memory. About 30 photographers tonight and half were with my group! Gorgeous! Good old NIK! I love using it and you're right Don, it's so easy! what for a cool location!! amazing dof and a great great backlight!!! Great and valuable points Don. I love the colors in the sky, horizon and Barrell Cactus especially, all aided by your Color Efex Pro...The mid frame elements (the cliffs) are very striking and dramatic as they remain a bit darker, but not so much that we don't see the detail and sheer drops and feel the impact of that...good grief! The tinges of snow and the other land elements and rocks all add to the wonderful variety and contrast of colors here. But the thing that REALLY gets me with this image (and you pointed this out, too), is the fact that here we have this expansive view all the way down the 6,000 + feet to the valley floor, all tack sharp!! Resulting in a completely dramatic and striking composition...I love desert images anyway, and this is a magnificent and wonderful piece! Best wishes to you and Gary! @Denny Jump Photo: Gary and I have just finished day two of my Big Sur workshop and things are going good. WInter workshops mean 6 am wakeup calls - can't beat that! I agree....Sometimes I need a cooling off period, or I need to learn some better techniques for processing, but it is always fun to go back and "relive" a photo trip! This one is great- the little cactus is the star of the show, with a gorgeous supporting cast! @Tracy: These little cactus grow in the strangest locations, even in frigid temps at high altitudes! I'm a huge fan of Nik's software (and blame you for introducing me to it). I sometimes go through periods when I am not motivated to go out and shoot, the inspiration just ebbs away sometimes. It is then that I return to older images and see if I can approach them with today's eye and today's software. @Curly: We are all learning and growing in the way we see images and even finished prints. Newer software is making processing so much more easy and fun (and less time consuming). Hope you are doing well Curly. Excellent shot, has almost a supernatural feel! @Lucie: Thanks Lucie for your nice comment. Death Valley is kind of a supernatural place. Love the composition and the intensive colors, well done! @DarkElf: This is what I was unable to translate in my initial processing of this image but was able to get in this attempt. It is subtle but enough to make the image work for me. Thanks for expressing your opinions. Beautiful shot Don - also - just saw your article in the Singh-Ray newsletter - good stuff ! Wonderful landscape and smart contrast between near and far. In my opinion, the painter Hiroshige would have appreciated this picture. Do You know his famous masterpiece "100 views of Edo"? @Hil: Unfortunately I do not Hil, but I will take a look. Thanks! it seems so easy making amazing pictures like you do... or is this simply the place were you live and work, surrounded by so many beautifull and different landscape ? I am always bluffed by your pictures ! @Marc: Hi Marc, not sure if it's always easy, I struggle just lie everyone else. We do live in an amazing place but Death Valley is about a 8 - 9 hour drive from my home so it is not that close. Having said that, I will be their next Tuesday teaching a workshop. Thanks for your comment. I like this composition with the foreground and strong diagonal left to right. A great scene wonderful work an an older image!